First of all, Merry Christmas to anyone who celebrates. 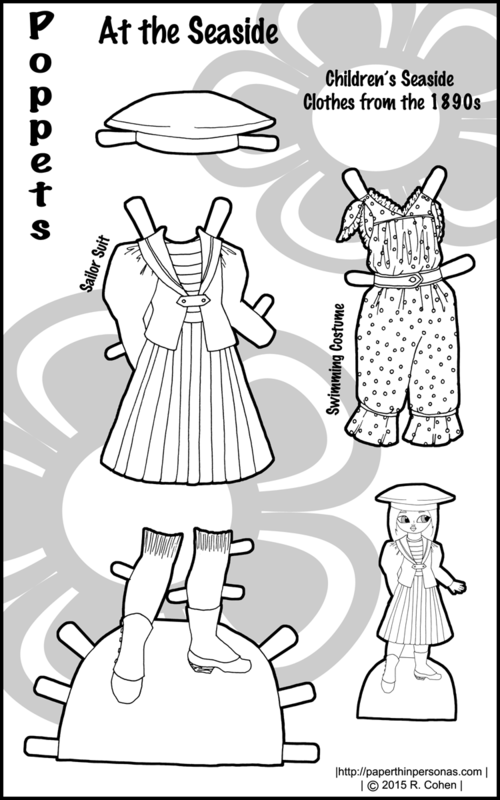 Today we have a completely non-thematic set of paper doll clothes. 🙂 This is what happens to me at the end of the year. 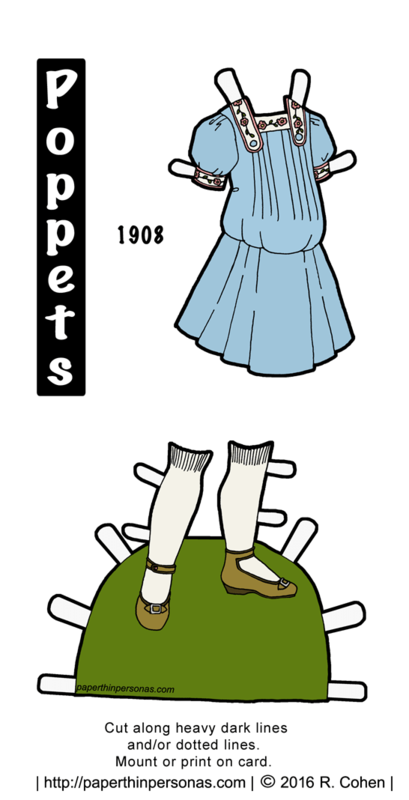 I’m just all about getting the stuff I have done posted, so today we have some 1890s beachwear for the Poppets with a sailor suit and a swim suit. Sailor suits were very popular in the 1890s and they were worn by all different ages of children (and some adults). You can find examples all over the place if you happen to be looking. 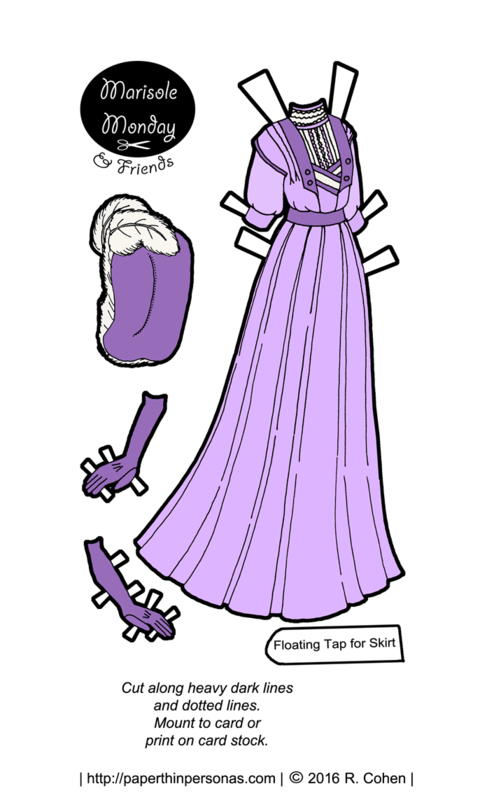 I used the book Children’s Fashions, 1860–1912: 1,065 Costume Designs from “La Mode Illustree” which happens to be out of print, but is a great resource. Both the swimming costume and the sailor suit come from the illustrations in this book. One of the interesting things about sailor suits is that they didn’t change in style much. Here is an example from La Semaine De Suzette in 1908. (La Semaine De Suzette was a French children’s magazine that published sewing patterns for the doll Bleuette through out its many year run. There are passionate collectors of the dolls who make the wonderful patterns. 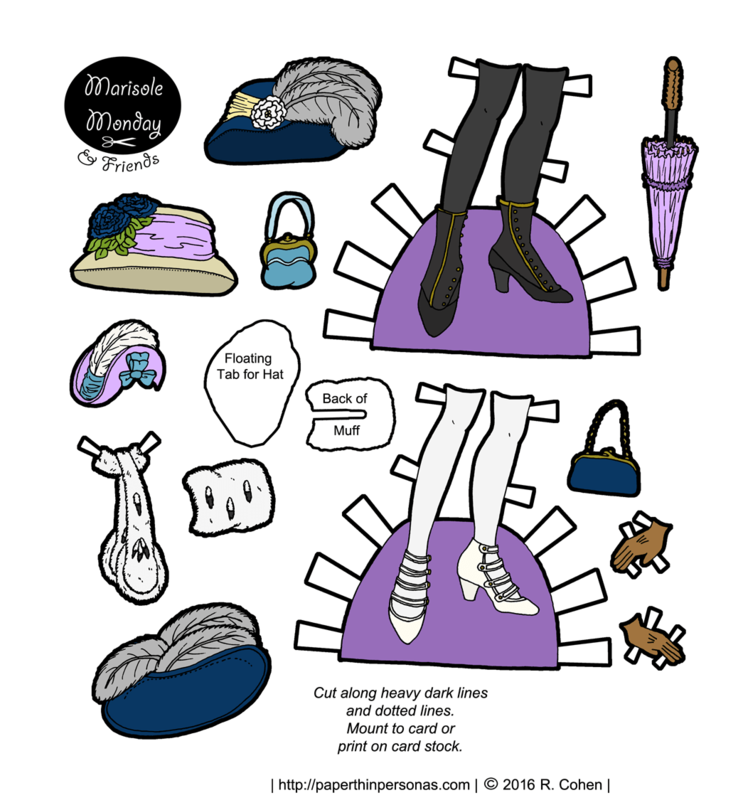 Someday I would love to do a paper doll of some of the amazing Bleuette patterns.) Some more examples from various eras include this sailor suit from the 1920s, a magazine illustration from 1890 and an extant example from 1905. 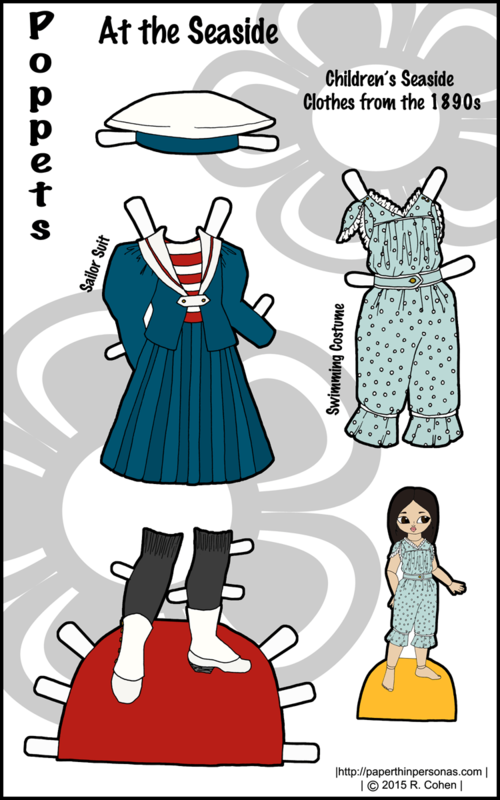 Clearly, the sailor suit stuck around for a long while, making them a great subject for paper doll clothes. 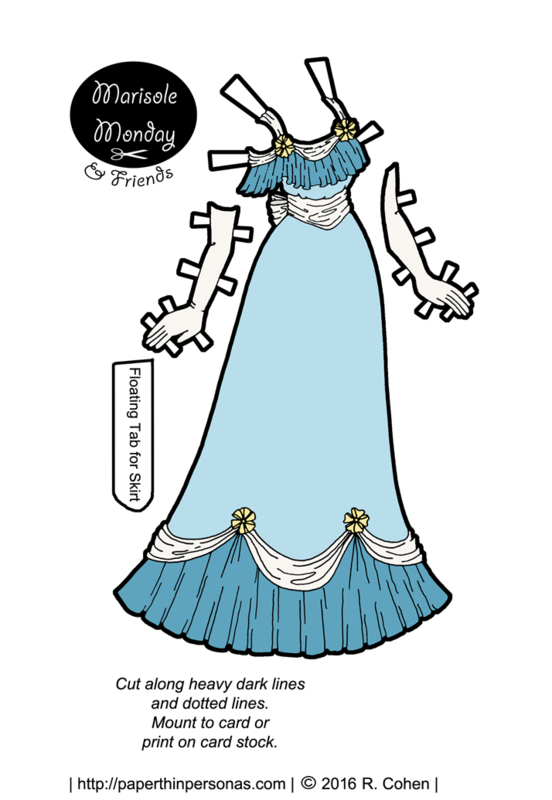 Our paper doll’s swimsuit is also from Children’s Fashions, 1860–1912: 1,065 Costume Designs from “La Mode Illustree”. Swimsuits in this era never look like they would be very comfortable or easy to swim in to me. Still I liked the little ruffles on the sleeves. 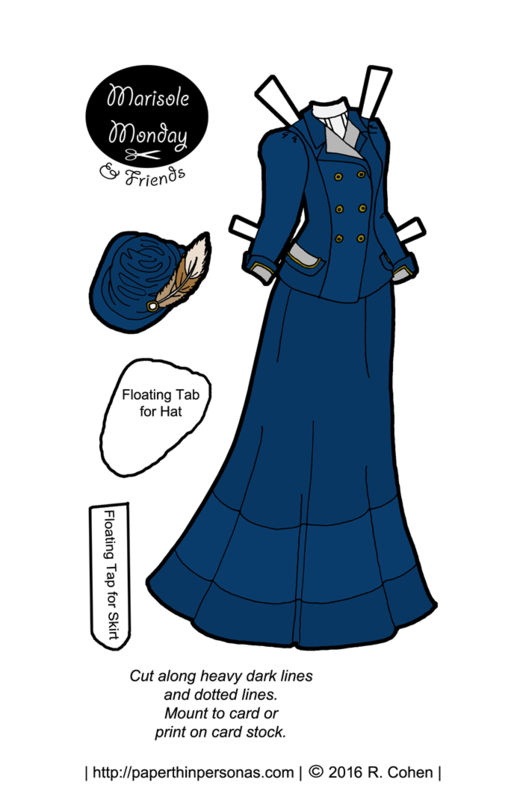 Posey is the paper doll modeling today’s 1890s outfits, but Peach probably has the most historical hair style of the bunch with her curls.